chef bill kim is kind of an all-star in chicago ... he's got belly shack, urban belly, and most recently : bellyq, located near ogden & randolph in the west loop. "bellyq redefines asian barbecue ... chef kim & his expert team take the best seasonal, locally farmed ingredients & craft them into a menu that’s bursting with flavors, from bright + crisp to smoky + earthy ... this is food that will spark your imagination as it satisfies your belly." this information is quite true. i've been to bellyq about five times now. it's right near my office, so we have a lot of work events there. i get the same thing every time (there are three vegan items on the menu) and this visit was no different. delish. 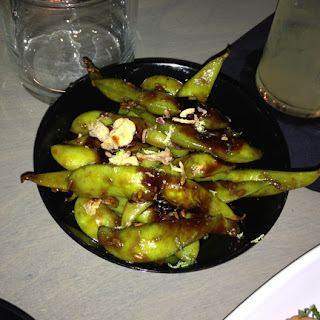 i sometimes hate ordering edamame at restaurants. i mean, you can make it at home in two seconds. but this version is definitely worth it. 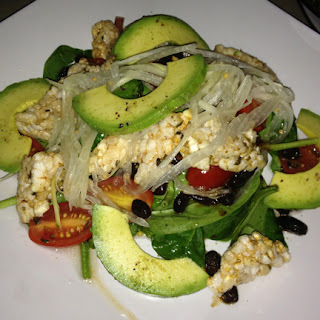 avocado, green papaya & tomatoes. i didn't order this last time i visited bellyq... and this time, it was so much better than i remembered. fresh ingredients + great flavor. rice cakes, mushrooms, zucchini, bok choy, onion & cumin. every restaurant i visit that has a hot pot on the menu, that's what i want. but usually, they aren't vegan. but at bellyq, vegans are lucky. and this is so so so good ... maybe not ideal for a hot summer night, but still : a+++. 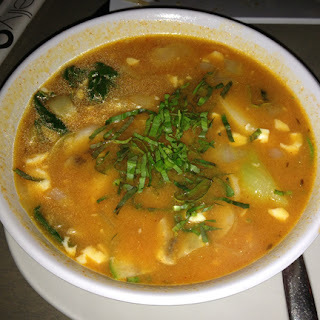 i love the tofu + rice cakes and the broth is super spicy. doesn't really get better. kayla, jessie, blair, me, carly. xo. the food at bellyq is fantastic ... the drinks are fabulous ... and it's just a generally fun place to wine & dine. check it out. side note : bellyq also has a lunch situation ... here's my post from a while back : bq2go. glad you enjoy the blog! i have a lot of fun trying new places!